"Or have I sung theirs?" "The poem has been soaking in my mind for at least eight years," Elgar told a newspaper reporter during the summer of 1900, just weeks before the première of The Dream of Gerontius in Birmingham. Those eight years were crucial to Elgar's development as a composer. From 1892 to 1900 he wrote six large-scale works for voices, beginning with The Black Knight in 1892 and including King Olaf in 1896, Caractacus in 1898 and Sea Pictures in 1899. He also conducted the premières of each one, gaining valuable experience in the practical side of vocal music. Most importantly, perhaps, he gained confidence, particularly after the great success of the Enigma Variations in 1899 made him a national figure. At forty-two, Elgar had waited long for recognition, and he now felt able to take on a subject that offered an imaginative scope far beyond anything he had done before: Cardinal Newman's famous poem of spiritual discovery. Elgar set slightly less than half of the poem, cutting whole sections and shortening others to focus on its central narrative: the story of a man's death and his soul's journey into the next world. Gerontius is written for tenor, mezzo-soprano, bass, chorus and orchestra. The work opens with a somber melody in D-minor marked pianissimo. 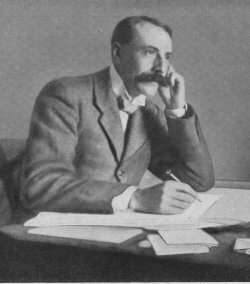 This was named the Judgement theme by Elgar's friend and publisher August Jaeger, who wrote a detailed analysis of the score. The opening subject launches an orchestral Prelude that presents all of the work's main themes. They are some of Elgar's most fertile melodic ideas, dovetailed here so that one flows seamlessly into the next. When the theme arrives that will accompany Gerontius's anguished prayer in Part 1, the music builds to an urgent climax with organ accompaniment and pounding timpani. A march-like theme brings us to a brief reprise of some of the several earlier subjects, leading directly into the tenor's first solo. Elgar developed a unique vocal style for Gerontius, neither simple recitative nor full singing, but one that allows the music to shape itself to the words in a natural and expressive way, and we can hear it in the first line, 'Jesu, Maria, I am near to death ... .' This treatment can modulate easily into song, as it does here on the very next line, 'And thou are calling me.' Elgar's sketches show that he went through draft after draft to achieve this kind of flexibility throughout the work, partly so that the vocal line could respond to the poem's sudden shifts of mood: in these eighteen opening lines Gerontius goes through feelings of desperation, terror, supplication and then exhausted calm. Now the friends at Gerontius's bedside pray for him with a 'Kyrie eleison' ('Lord have mercy') that begins in the semi-chorus without accompaniment. At the rehearsals for the first performance, Elgar urged the chorus not to sing as though they were in church, but with 'more tears in their voices,' as though they were at the side of a dying friend. His friends' prayers rouse Gerontius to a more spirited solo, followed by a second choral section, 'Be merciful, be gracious,' in the form of a subdued fugue. 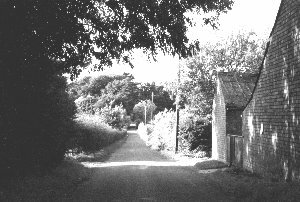 "I cycled over from Ledbury to lunch with him ... he was greatly relieved at having that instant written his name under the score of the last bar [of Gerontius] ... I begged Elgar to remain just as he was while I went down and fetched my camera." The music then shifts into 3/4 time for 'Sanctus fortis', Gerontius's dramatic statement of faith. It is a passionate declaration, not a pious one - the final 'Sanctus fortis' is marked piangendo ('wailingly'). "I imagined Gerontius to be a man like us," Elgar told Jaeger. "Not a priest or a saint, but a sinner ... no end of a worldly man in his life, & now brought to book. Therefore I've not filled his part with Church tunes & rubbish but a good, healthy, full-blooded romantic, remembered worldliness." The chorus sings 'Rescure him, O Lord,' and then we hear the last earthly words of Gerontius, 'Novissima hora est,' ('It is the final hour'). With only a brief pause, the Priest, sung by the bass, gives Gerontius his blessing: 'Proficiscere, anima Christiana, de hoc mundo' ('Go forth from this world, Christian soul'). Elgar's melody here conveys faith, sorrow and wonder, all at once, in one of the work's most inspired passages. At the words 'Go in the name of Angels and Archangels,' the chorus joins in, building to a triple forte on the words 'go forth.' The Priest sings a second benediction, the accompaniment softens to a single melody for the first violins, and then one last, gentle swell of orchestra and voices on the words 'through Christ our Lord' brings the movement to an end in D-major. A delicate, new melody in F-major and 3/4 time marked dolce e legato ('sweet and smooth') conveys the 'inexpressive lightness' felt by Gerontius's soul after death. When his soul begins to sing 'I went to sleep; and now I am refreshed,' the feverishness of his death is gone, and all is deep calm. The time signature is significant: much of Part 2 is in triple time, giving the music a greater lightness than the quarter time rhythms that predominate in Part 1. Gerontius's soul soon realises that he is not alone; he hears an Angel singing 'a heart-subduing melody.' In Newman's poem, the Angel is male, but Elgar gives the role to a mezzo-soprano. Her first solo is magical, creating a feeling of exhultation with the simplest musical means: listen to how the near-recitative of the first five lines lifts into song for a resonant 'Alleluia'. Now comes one of the work's most memorable passages, as the soul and the Angel converse and the musical setting interprets the words with great imagination. The soul is hesitant, but curious to know 'a maze of things' about his new condition. The Angel's response is understanding and compassionate: 'You cannot now/Cherish a wish which ought not to be wished.' Their dialogue leads into a radiant duet, the Angel reassuring the soul about his fate, the soul singing of his new-found joy. 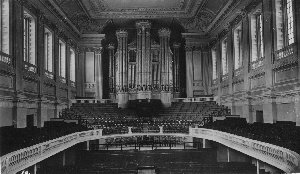 The first performance of Gerontius, on 3 October 1900, was conducted by the legendary Hans Richter at Birmingham Town Hall as part of the Birmingham Festival. And then all the voices join together triple-forte, singing 'Praise to the Holiest' with thrilling support from the orchestra. This is the beginning of one of the most elaborate and stirring passages in choral music : Elgar called it 'the great Blaze.' The music swings into a second subject in 6/4 time on the words 'O loving wisdom of our God!' and the two subjects blossom and intertwine in soaring four- and eight-part harmonies. As a boy, Elgar lived just down the street from Worcester Cathedral and spent many happy hours listening to the music there. Later he learned the choral works of Bach, Handel, Mendelssohn, Brahms and Dvorak by playing violin in the Three Choirs festivals. His knowledge of cathedral acoustics and of choral writing are apparent throughout this delightfully intricate song of praise. When the hymn's refrain is sung for the last time, voices and orchestra recombine in C-major for a final, echoing chord. The sight of God is overwhelming: the soul sings 'Take me away,' drawing together many earlier themes, and the Souls in Purgatory sing the psalm, 'Lord, Thou has been our refuge'. Now comes the great song of compassion that crowns the work, the Angel's 'Softly and gently, dearly-ransomed soul,' with loving counterpoint from the chorus and semi-chorus. There is an echo of 'Praise to the Holiest' and of the psalm, and then, with a rapid diminuendo, the repeated 'Amen' moves into D-major to bring this wonderful work softly and serenely to a close.